Emory Gordy, Jr. is an American musician and music producer. Since 1989, he has been married to country music artist Patty Loveless. 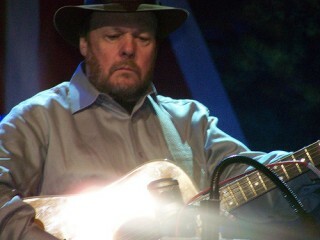 Gordy was inducted into the Georgia Music Hall of Fame in 1992. Born December 25, 1944, in Atlanta, Georgia, Gordy quickly gravitated to anything that made music. By age four he knew his way around a piano keyboard; at six he had begun to tackle the trumpet and would soon learn the banjo, euphonium, guitar, and ukelele. In high school Gordy divided his time and talents between string bands, dixieland bands, and a top 40 garage band, honing his musical skills and learning to arrange music. After graduation he continued his musical studies at Georgia State University, performing French horn in the concert band. -As producer Bellamy Brothers, When We Were Boys, Elektra, 1982. -Vince Gill, Turn Me Loose, RCA, 1984. -Vince Gill, The Things That Matter, RCA, 1985. -(With Tony Brown) Steve Earle, Guitar Town, MCA, 1986. -Bellamy Brothers, Country Rap, MCA, 1987. -(With Emmylou Harris) Emmylou Harris, Angel Band, Warner Bros., 1987. -Bill Monroe, Bluegrass '87, MCA, 1987. -Bill Monroe, Bill Monroe and the Stars of Bluegrass Hall of Fame, MCA, 1988. -Bill Monroe, Southern Flavor, MCA, 1989. -Bellamy Brothers, Reality Check, MCA, 1990. -Aaron Tippin, You've Got to Stand for Something, RCA, 1990. -Aaron Tippin, Read between the Lines, RCA, 1992. -Patty Loveless, Only What I Feel, Epic, 1993. -Jimmie Dale Gilmore, Spinning around the Sun, Elektra, 1993. -Patty Loveless, When Fallen Angels Fly, Epic, 1994. -Patty Loveless, Trouble with the Truth, Epic, 1995. -George Jones, Walls Can Fall, MCA. -Earl Thomas Conley, The Heart of It All, MCA. -Riders in the Sky, The Cowboy Way, MCA. View the full website biography of Emory Gordy, Jr..